I don’t do deprivation. It has no place in my food (or health) philosophy. I don't believe in restrictive diets or starvation as a means to some patriarchical BS "ideal body". Even thinking about that makes me white-hot furious! I will only recommend cutting out foods if there is a compelling scientific justification. And while I'm on the topic, few things make me angrier than a dubiously-qualified health blogger or "wellness guru" telling people who don't have an allergy or intolerance to cut numerous foods and food groups out of their diets - and charging for it! So now that I've told you I don't believe in deprivation or cutting out food groups, I'm now going to recommend - in the most strenuous terms - that you cut something out of your diet. I want you to ditch sugar sweetened drinks, sugary sodas soft drinks, flavoured mineral waters, cordials, energy drinks, bottled fruit drinks and juices. All of it! You see, we have normalised the consumption of dangerously excessive amounts of sugar. And sugary sodas and softdrinks are contributing a frightening amount of sugar to the Australian diet. This was on display at a local pharmacy last month. Scary, huh?!? These products (I'm not going to call them food) are so energy-dense they are extremely likely to push the average person into overnutrition. And science is increasingly revealing that overnutrition is where the damage is done! I wrote about the dangers of over nutrition here! And research has shown that when we consume these high-sugar, high-calorie sugary sodas, we don’t compensate by reducing our intake of other foods. In fact, there are studies that show an association between sugary sodas and increased food intake, which may be due to reduced feelings of satisfaction or appetite stimulation. Sugar consumption is irrefutably linked with dental cavities. 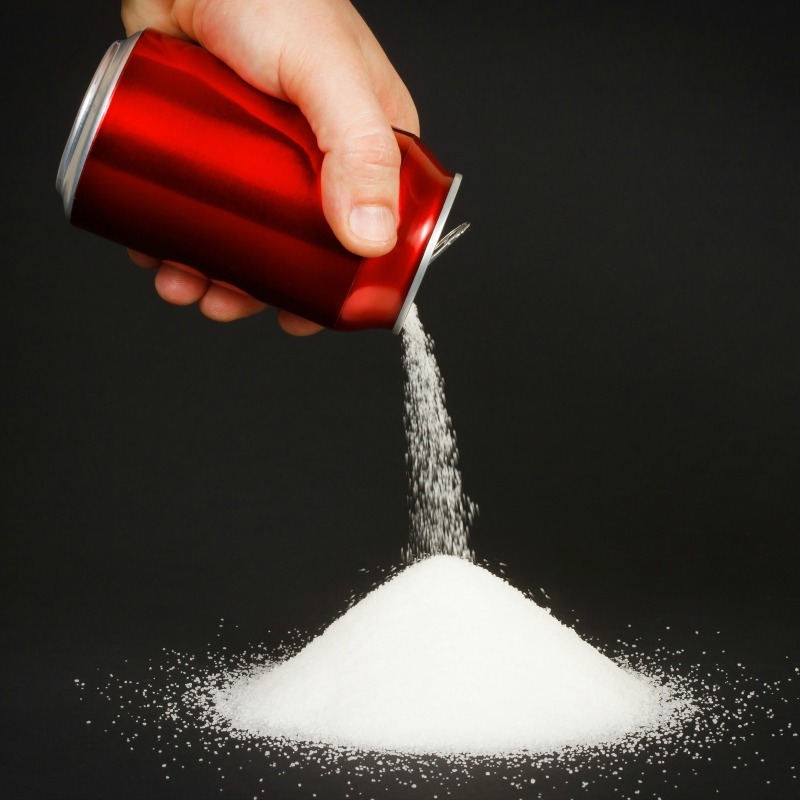 There are studies linking sugar sweetened beverages with obesity, which is itself a significant risk factor for many serious illnesses including cancers and kidney disease. Studies have also linked sugar sweetened beverages with metabolic syndrome, type 2 diabetes, stroke and other cardio metabolic risk factors such a hypertension and blood sugar levels. These images are from the Australian National Preventive Health Agency Report: Sugar Sweetened Beverages, Obesity & Health. Adding just one can of sugary soda a day to your normal diet has been estimated to result in a weight gain of almost 7kg! And a study released late last year found that drinking just two sodas per day can double your risk of type 2 diabetes. So cutting them out should be a no-brainer.... But the latest Australian Health Survey revealed that 42% of Australians consume sugar sweetened beverages. The amounts consumed ranged from 375mL to 1.5L a day, with an average sugar intake from these drinks of 13 teaspoons of sugar! Every day!! Public health advocates in Australia and around the world are sounding the alarm bells; The World Health Organisation recommends restriction, and the World Cancer Research Fund recommends avoiding them entirely. Water. If you find plain water too boring you can flavour it with a squeeze or slice or two of lemon, lime, orange or cucumber. A veggie heavy, low sugar green smoothie. I wrote here about my top tips for awesome green smoothies here. Milk of your choice - dairy, almond, or other nut milk. Herbal teas, hot or chilled. There are so many out there, so start experimenting! I have seen first-hand the huge positive impact that this one simple change can have - healthy weight loss, reversing of fatty liver, lowered blood triglycerides, better mood, energy, concentration and glycemic control. You will take in a whole lot less energy - and more micronutrients. In fact, for some people, simply making this one simple change is enough to see them drop several sizes (and avoid cavities!). So there you have it! The anti-deprivation-refuses-to-cut-out-any-foods nutritionist has drawn her line in the sand: sugary sodas have no place in a healthy diet. At best these drinks are a source of unnecessary excess calories. At worst, they contribute to tooth decay, obesity, fatty liver, type 2 diabetes, hypertension and much more. One of the simplest and most effective positive changes you can make for your health (and your waistline!!) is to cut out these drinks. Imamura F, O’Connor L, Ye Z, Mursu J, Hayashino Y, Bhupathiraju SN, Forouhi NG. Consumption of sugar sweetened beverages, artificially sweetened beverages, and fruit juice and incidence of type 2 diabetes: systematic review, meta-analysis, and estimation of population attributable fraction. Bmj. 2015 Jul 21;351:h3576. Zheng M, Allman-Farinelli M, Heitmann BL, Rangan A. Substitution of sugar-sweetened beverages with other beverage alternatives: a review of long-term health outcomes. Journal of the Academy of Nutrition and Dietetics. 2015 May 31;115(5):767-79. Hu FB. Resolved: there is sufficient scientific evidence that decreasing sugar‐sweetened beverage consumption will reduce the prevalence of obesity and obesity‐related diseases. Obesity reviews. 2013 Aug 1;14(8):606-19. Mozaffarian D. The politics and science of soda and our health. The Lancet. 2016 May 28;387(10034):2192-3. Larsson SC, Akesson A, Wolk A. Sweetened beverage consumption is associated with increased risk of stroke in women and men. J Nutr 2014; 144(6): 856-60. Löfvenborg JE, Andersson T, Carlsson PO, Dorkhan M, Groop L, Martinell M, Tuomi T, Wolk A, Carlsson S. Sweetened beverage intake and risk of latent autoimmune diabetes in adults (LADA) and type 2 diabetes. European Journal of Endocrinology. 2016 Dec 1;175(6):605-14.